What is the number one thing you feel is cluttering your home? One of our big things is paper. Yes, yes, we all know about online bill pay and going “green” with our statements. But still, there is… PAPER! We have kid artwork (times2-3 kids), school papers and newsletters (times 2 kids), church bulletins, Sunday School/AWANA papers (times 2 kids), random bills, receipts, and oh yah, did I mention kid artwork?! So what happens to all this paper? It probably gets stacked up until you can’t take it anymore and go on a recycling and/or filing rampage and waste hours cleaning up. I know, I have totally been there and still find myself struggling with this at times. Even as “particular” and detailed as I am with our filing cabinet, it’s not always handy or time efficient to go running into the office to file each sheet of paper that comes our way. I learned this simple… yes, SIMPLE… filing system a few years back from a professional organizer who came and spoke to our MOPS (Mothers of PreSchoolers) group. I immediately went out and bought the supplies to put our own filing system together. That was 4 years ago and to this day, I still LOVE this filing system! 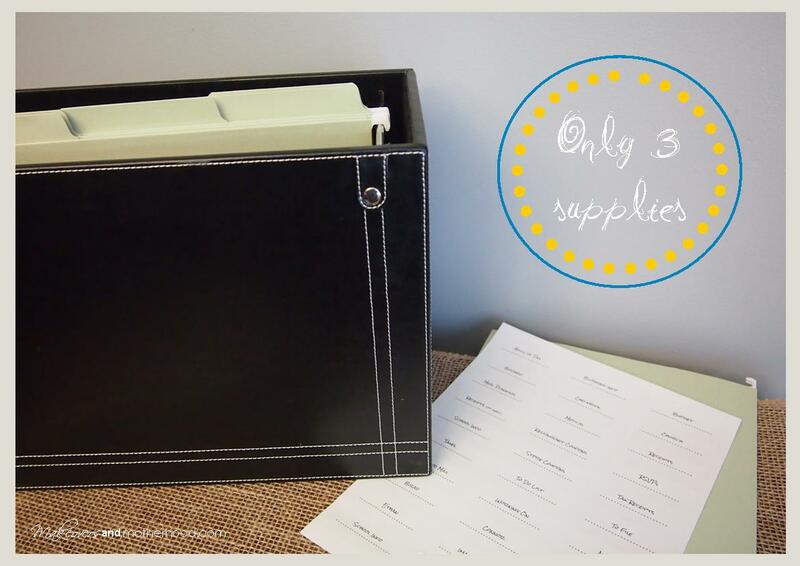 I also love that this file box only takes 3 items to put together! 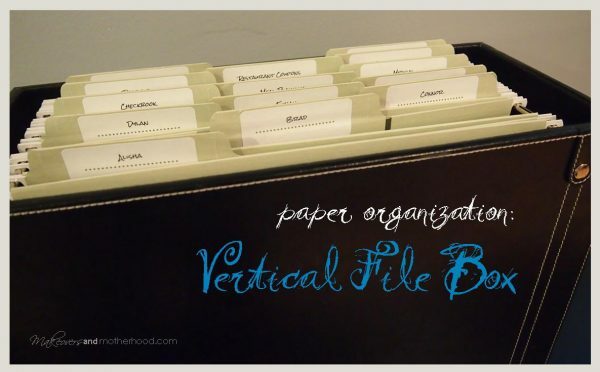 Vertical File Box – I purchased ours at an office supply store. It is leather so it cost a bit more $25-$30 range. You can also find them in the school/office supply sections of your favorite superstore for about $10-$25. 3-Tabbed Hanging File Folders – These folders have the tab as part of the folder, not a separate plastic tab. Printable Labels — You could write directly on the file folder itself, but then you wouldn’t have my handy little labels to give some simple flair. The labels you’ll want are 30 to a sheet. They are 1×2 5/8” mailing labels same size as Avery 5160. 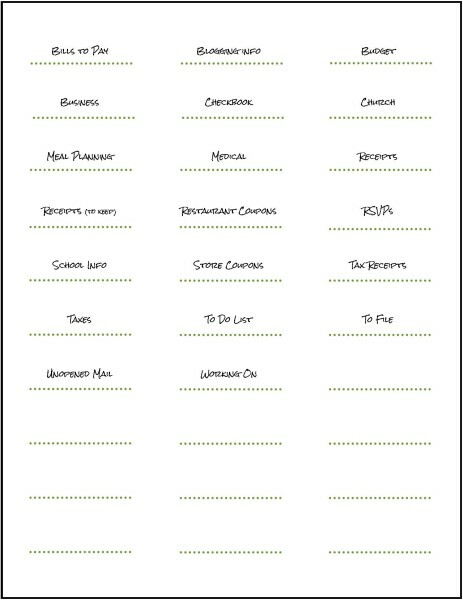 Here is a printable sheet of label categories for you to use and a few blank ones at the bottom for you to personalize yourself. I gave each member of our family their own file. And I placed these family files in the very front of the box. Then, I alphabetized the rest of the folder categories so they are easy to search for. Our boys’ artwork can be overwhelming at times. While I have several art displays (see DIY Large Art Frame, DIY Framed Bulletin Board Art Display, and DIY Art Frames), we still have stacks of masterpieces flooding our home. My solution… give each child his own file folder for those pieces he really wants to keep that have already had their turn being displayed. Once that folder is full, we’ll file it in each child’s memory box (more on that at another time). Until then, it gets the paper off my countertop. We like a good deal and will keep hold of store and restaurant coupons. So we have a folder for each of those categories which is easy to pull out and take with us on a day’s outing or when looking for a place to dine out. Help your family members use this system successfully. Show your kids their folder and explain what papers you will be putting in there. Get a system worked out with your husband. For awhile I had to regularly remind my husband to check his folder. Now, I lay any paperwork I need him to look at on the kitchen island for him to go through when he gets home from work. After he reviews it and decides what he wants kept or not, he then files it in the file box. His folder is now his personal space for him, not me overloading it with stuff for him. Keep your filing system accessible. We open our mail on our kitchen island. Our filing system is just a few steps away on our sideboard which is under our message board. It is right in the middle of our day-to-day activity areas. If it were tucked away, I would never use it. Plus, I can quickly hang up a paper that needs immediate attention or jot a to-do task on the message board right above it. Remember that once your file folder is full, it is time to permanently file that item. Or… set up a once or twice a month schedule to go through these folders and permanently file them. Our goal here is to temporarily contain your papers until you can find a permanent home for them be it a file cabinet, or with your scrapbook supplies, or in the recycling after the paper is no longer needed. Whatever you do, don’t start piling again! Having a quick and convenient spot to file our papers when they come in has been such a time saver and blessing to me. I am no longer bombarded with the excess clutter of papers and it gives me time (when I have time) to do all my filing of each category at once. I hope this helps you and your home feel better organized! Ooh thank you. I have a vertical box. I’ll be printing and redoing my files today with your help. Awesome! I hope it works well for you and your family! This is right on time for me. At the end of my tape for my label maker. Thanks so much for sharing! Perfect! I hope you find it useful and that it helps keep your counters clear! Oh hooray, Patty! I hope you’ll find it as useful as our family does! AND… make sure to check out the post going live today… “Clear Out the Clutter: Paper Challenge”! 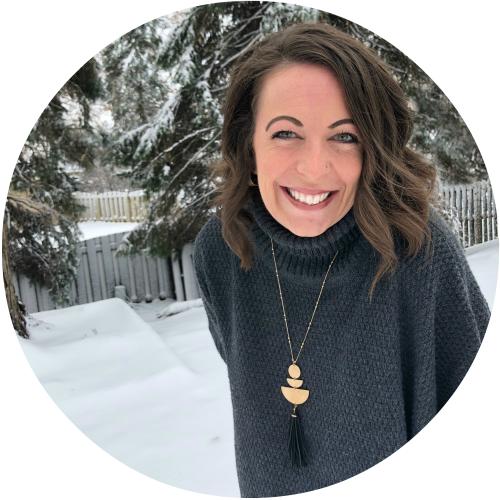 I would LOVE for you to join in the challenge! You may be surprised how much paper you really do have.